The model is stitched on "Heroic" linen from Picture This Plus using overdyed cotton threads from Weeks Dye Works. It was fun to design and stitch, hopefully a few of you will enjoy stitching it as much as I did! I am debating adding a trim on the edges of one or both of them, but there's nothing at the house that works for me. I'll check Mom's stash when I drop by her house later today and then maybe swing by M's as well. I always love these little designs of Chessie and Me! Which brings me to the reasons why this week has been so challenging. 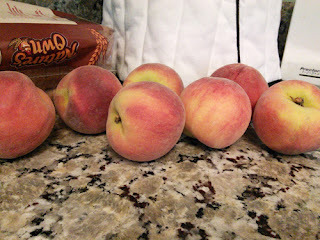 For starters, my husband spent most of the week out of town on a business trip. He doesn't love the traveling, and I don't love his not being around, so we were mildly stressed to begin with. In addition, this week was Vacation Bible School at our church. For the first time ever, I volunteered as a teacher. I hadn't been to a VBS since I was a child myself! Do not get me wrong, I very much enjoyed my teaching experience. The kids were funny and sweet and adorable. But keeping them safe and happy takes a lot of energy. A lot. Totally worth it, but tiring. Then, Tuesday evening, this cute little grey guy here put the scary in my week. About 9:30 pm, he starts peeing in all the wrong places. Gross, and a sign that of a bladder infection or uti, which can be deadly in cats. So off to the emergency vet we go. We arrive back home around 12:30 in the morning (yep, see where that exhausting part is happening), with some meds and instructions to check back in if things do not improve within 24-36 hours. 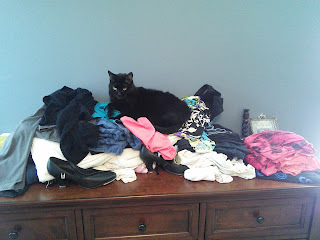 Lucky is quarantined in the master bathroom with all the rugs removed so that, should he be unable to use the litter box I provided, at least he wasn't going anywhere I couldn't easily clean up. The next day is full of worry and concern as he fails to really improve his bathroom behaviors. How long is too long? 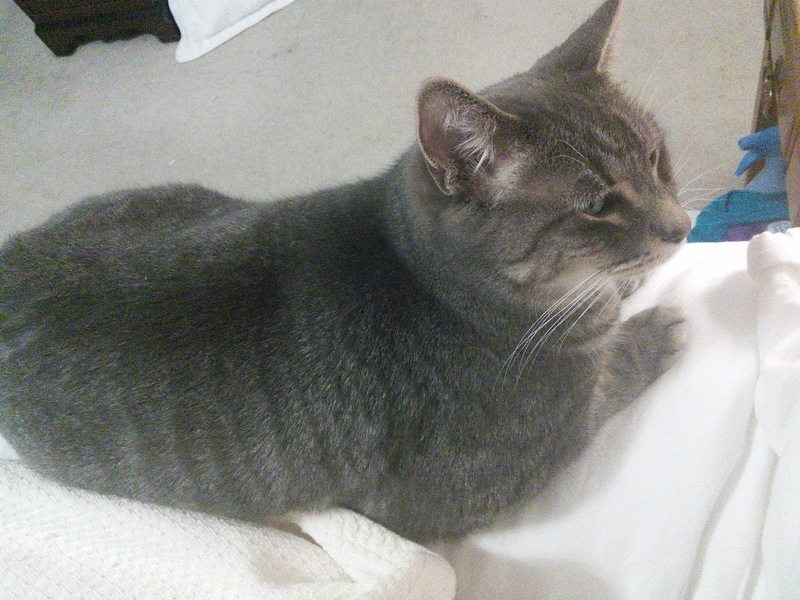 Is my cat going to get better or is he going to fall out and die before I realize he needs more help? No significant improvement, so Thursday am bright and early it's back to the emergency vet before the start of VBS. By Thursday afternoon, the vet informs me that his kidney levels are bad and they want him to stay overnight for an iv treatment. My poor little cat! My poor heart! I'm just sick on my stomach at the thought that he might be going into kidney failure. That was a long night for me, probably longer for the cat. Happily, the vet called the next morning to say that his kidney levels were back to normal, he was urinating appropriately, etc, etc. I brought him home after VBS and returned him to quarantine. I've spent an anxious few days watching over him, making sure he was still acting right and giving him tons and tons of pills (he loves that, not!). He's out of quarantine now, and seems to be over the hump. I hope so. 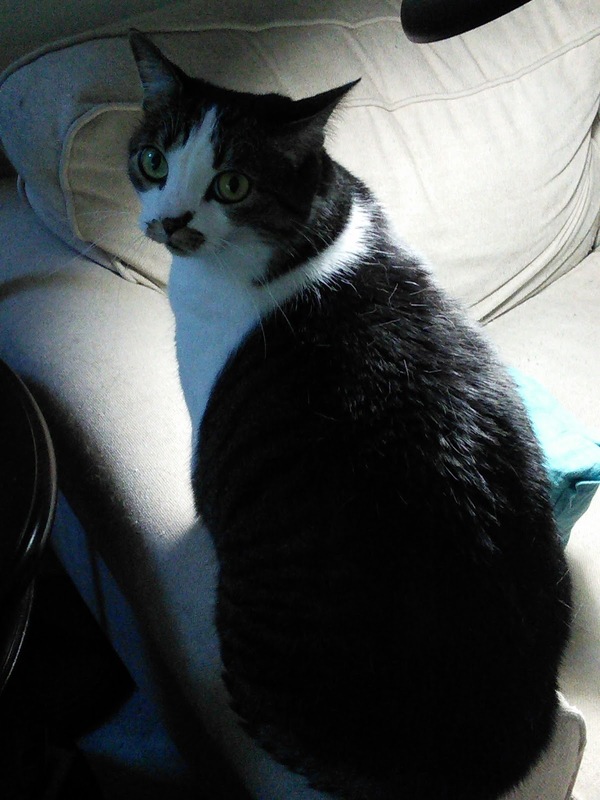 He'll be back at the vet's on Thursday for a checkup, assuming there are no more crises between now and then. I think about my anxiety and worry for him and then I think about how much worse it must be if it's your child instead of your cat. Wow! Tough to think about. Hope that wasn't tmi for anyone. Hope everyone is enjoying the beginning of summer. 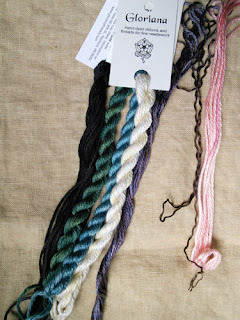 I am off to package some patterns. Later! Howdy folks! Hope everyone had a great weekend. Things were nice and relaxing here. Not too much going on (although fun stuff is in the works). I thought I'd share a photo of my geraniums. I really love geraniums, and I have some on my front steps every summer. I decided to dial back on the summer flower purchases this year though. 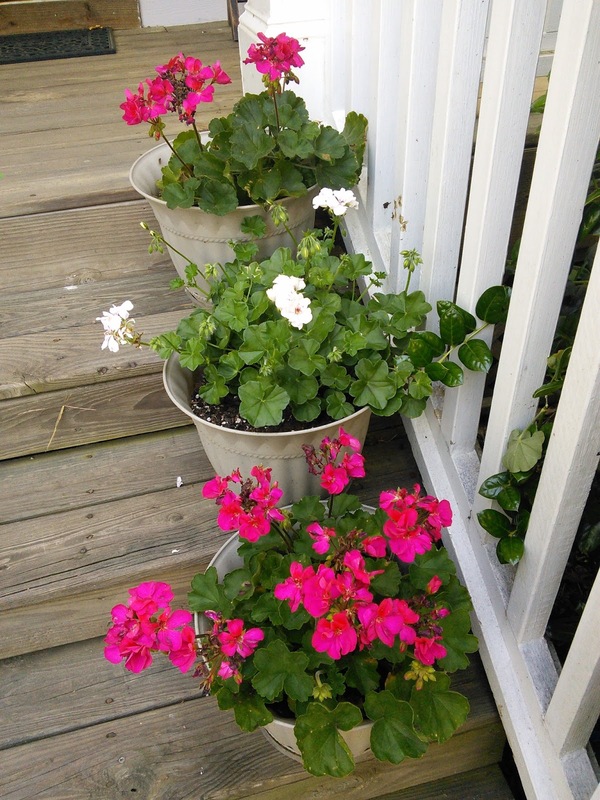 Only three pots of geraniums, and nothing in the porch baskets. Just seemed like a good summer for a break. I'll be back in flower power mode next summer though. We've been enjoying our usual crew of visitors to the bird feeder so far this year. 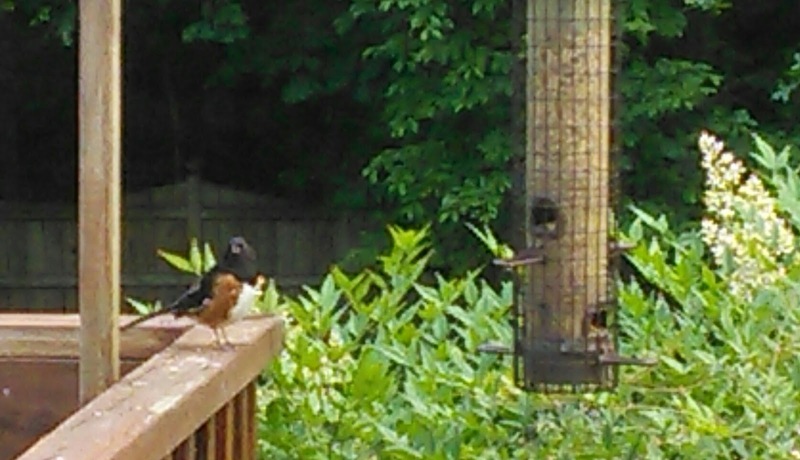 And a new guy showed up this evening: an eastern towhee. I'd actually seen a pair of them in the back part of the yard in February, but this is the first time I'd seen any at the feeder. Always love seeing new birds on the porch! 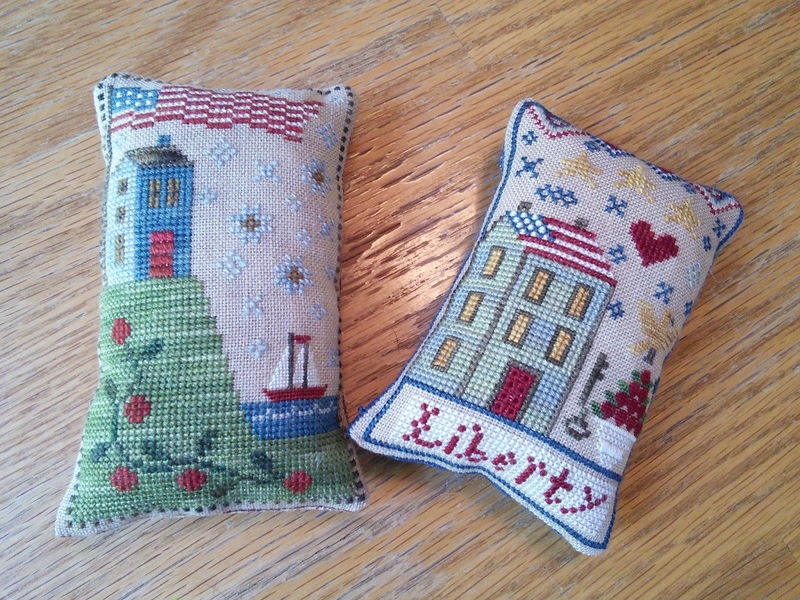 I've been up to quite a bit of stitching recently. Some of it I can't show you just yet (waiting on my first magazine publication, squee! ), but here's a sneak peek at a reproduction that I hope to released in February (yup, we're doing some long term planning here). 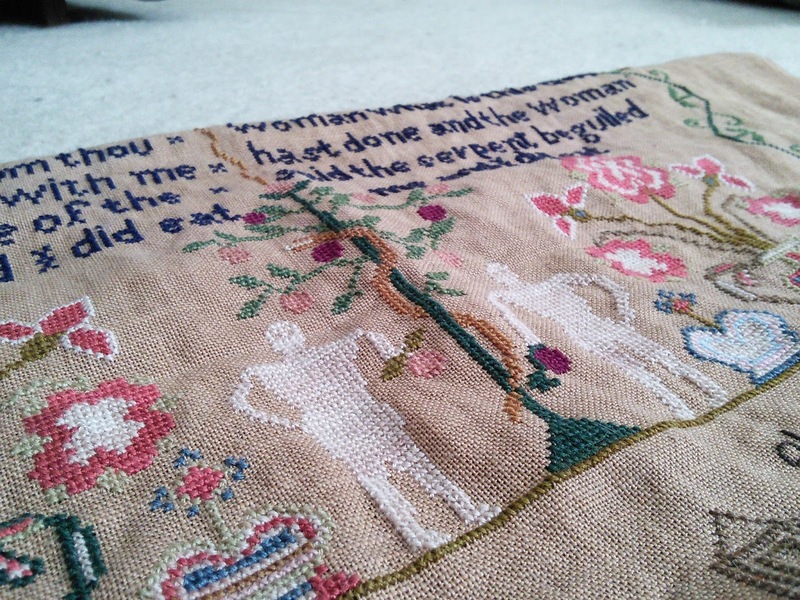 This is the mostly finished top third of a rather large sampler. I am having so much fun stitching it, and hope others will be interested as well! Not only do Adam and Eve make an appearance, complete with explanatory verse, but there's a gorgeous rendition of Solomon's Temple as well! Like I said, lots of fun. It may be a little early to start sharing previews, but I wanted to show something I've been working on! The cats are being, well, cats. This first shot is a rare snap of the elusive Miss Priss. Most of our house guests never get to see her sweet little face. She's so funny, and so very, very shy! Princess is highlighting the fact that I am not the world's best housekeeper by holding down the pile of 'clean' laundry on my dresser. At least she hasn't thrown the tap shoes on the floor. I'm auditing a tap class Tuesday evening to see if I can still hoof a bit. If all goes well, I may be spending my summer stomping my little heart out! Dear sweet Lucky! He looks exhausted doesn't he? Must be from all that unwanted smashing of buttons on the keyboard. 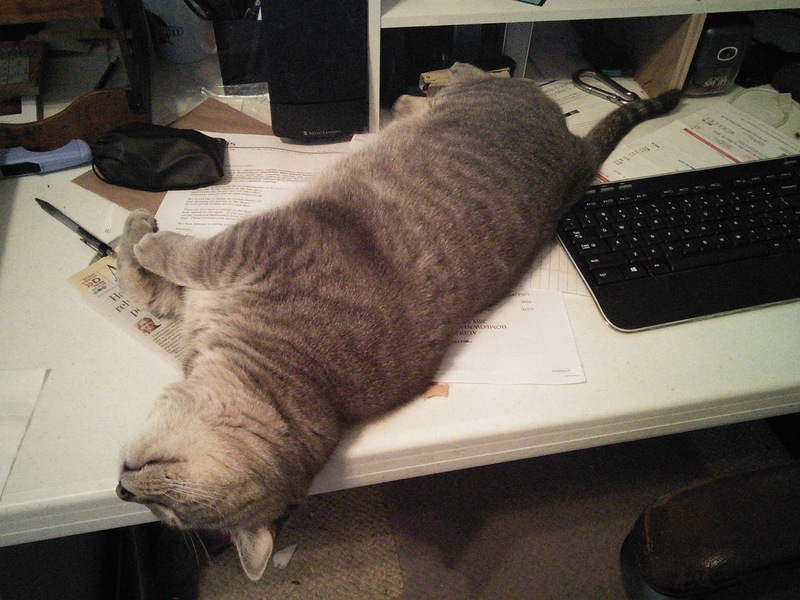 He can make typing a blog post quite challenging! Til next time, stay safe, and stay crafty! 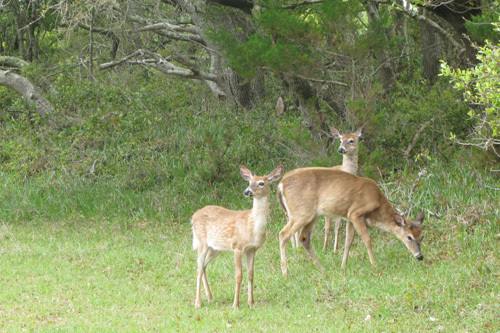 In my last post, I mentioned how much I enjoyed seeing the wildlife on our vacation at the Outer Banks. 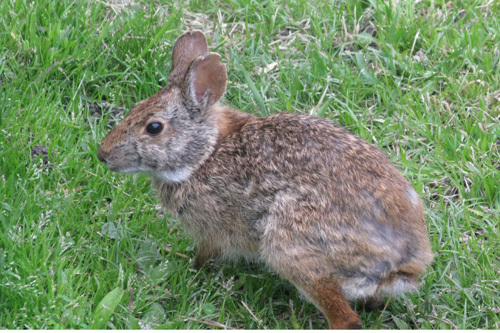 I thought I'd share a few pictures of that wildlife tonight. 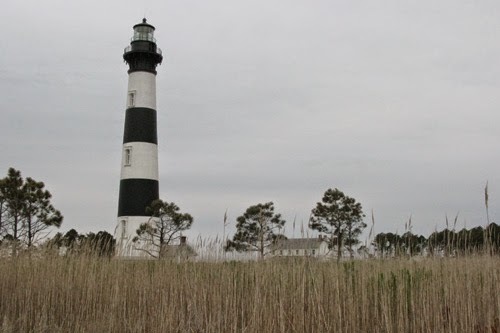 One of the first animal sightings we had was at Cape Hatteras Lighthouse. Look how close these deer let me get! We saw deer several times over the week, but this encounter was amazing to me because of their complete lack of fear. The wild rabbits were the most common animal we saw (other than birds of course). 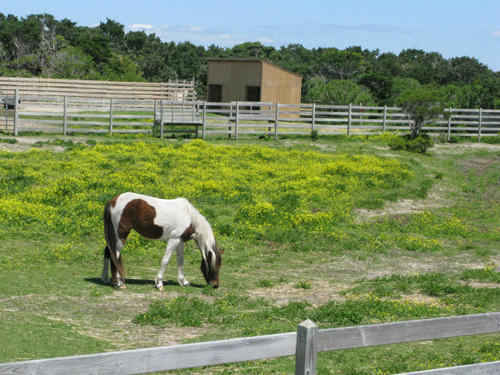 Oracoke Island has a population of wild ponies. I'm not sure how 'wild' they really are since they've been living in pens for decades (to protect them from cars and vice versa), but they were an enjoyable sight all the same. A few miles north of our beach cottage was the Pea Island National Wildlife Refuge. It's known as an excellent place to bird watch. 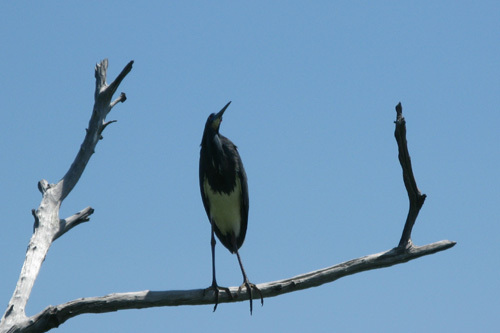 This tri-colored heron was one of the few birds that I could actually identify. A lot of them just looked like 'seabirds' to my untrained eye. 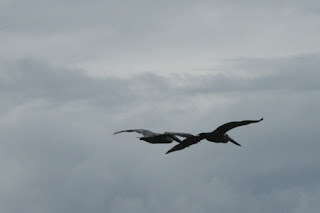 There were so many pelicans swooping about. I think there is something prehistoric about the appearance of these birds. They fascinate me. We also saw some sort of duck, migrating just off the shore in wave after wave. There were literally hundreds of them flying past our cottage. Don't know what they were, but Alton and I were both fascinated. Speaking of a prehistoric appearance, how about this lovely old turtle? 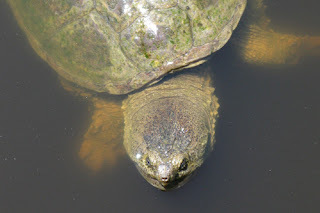 He was hanging out with a few friends in one of the ponds in the wildlife refuge. Probably the animals I was most excited about seeing were the dolphins we watched swimming just north of the Rodanthe Pier. They were swimming near a group of surfers. This was only the second time in my life that I'd seen dolphins in the wild, with the first time being on our honeymoon in Hawaii. I could have watched those guys knifing through the waters for hours if they hadn't swam away from view. That's all for tonight. Stay dry and stay safe! Hello everyone! It's certainly been a while since I posted. What can I say? Life has been busy, and I haven't always felt about sharing what's been going on. And sometimes I've felt like I couldn't share even if I wanted to. My stitching is often for design models, and my personal was filled with the rather large task of applying to be adoptive parents. That's right, Alton and I are hoping to adopt. We were approved in December, and now we're just waiting for someone to choose us to raise their beloved child. Some days I wonder if it will ever happen. Other days I am perfectly at peace, trusting that God will provide us with a baby if and when it is the right time. I'm sure I'll have more to share about the adoption process in the weeks and months to come, but for now, it's time for some vacation pictures! Late last month, Alton and I spent a week staying in a cottage on Hatteras Island here in North Carolina. 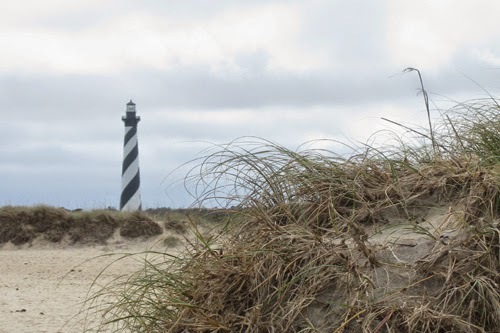 For those who don't know, OBX is a shortened version of "Outer Banks," the barrier islands on North Carolina's coast. 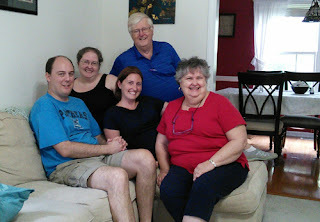 We didn't have the warmest or sunniest weather while we were there, but we really enjoyed our vacation. For one thing, it wasn't crowded at all! It made me super happy that we could walk along the beaches and see no one else at all for long stretches of time. And, it meant that we got to see a lot more wildlife than we probably would have otherwise. We headed onto the islands around midday on a Saturday, and immediately stopped at the Bodie Island lighthouse. Odd expressions and all, I think you can tell we're enjoying ourselves. 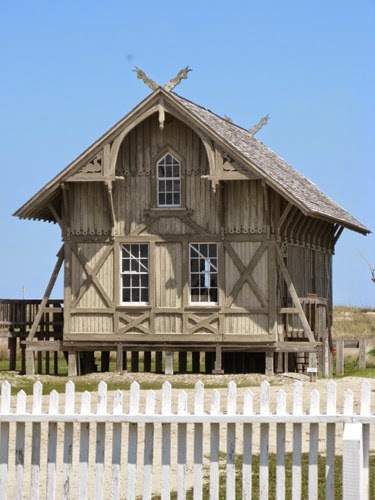 We actually stayed in the town of Rodanthe, about a block from the house made 'famous' in the Richard Gere movie "Nights in Rodanthe." No, we haven't seen the movie. I thought about renting it for us to watch, but it sounds like a cheesy romance, and I really have to be in the right mood for that. Each night we would open the windows in our bedroom just a little bit and listen to the sound of the waves crashing on the shore. I loved that! I find that sound so relaxing and peaceful. 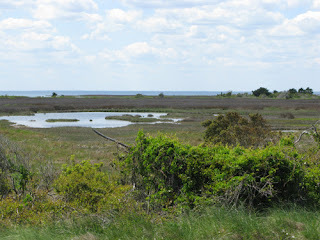 Just down the beach from us, in plain view from the cottage, was the Chicamacomico lifesaving station. Isn't that a cool looking building? It's the oldest building on the station's sight, and I really love it's unusual look. The site is now a museum (the station was decommissioned in the 1950s) and we were able to tour several buildings. In the summer, they do lifesaving drills to show what it would have been like if they had to rescue people from a distressed ship. 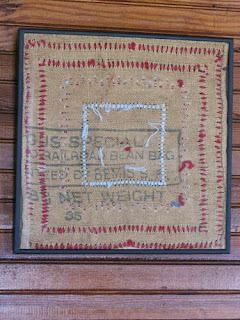 Inside the Midgett house, which is on the station grounds, we saw this piece of needlework hanging in one of the bedrooms. I've never seen anything quite like it. It's obviously a piece of feed sack with thick wool yarn drawn through it. 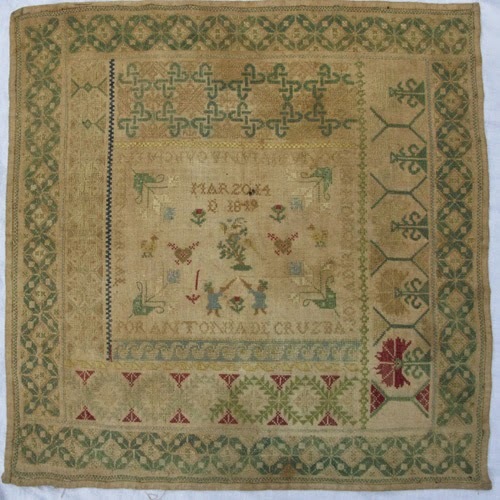 Some sort of early 20th century sampler? A pillow case? I'm just not sure! It's interesting though. We also visited the Cape Hatteras lighthouse, which is the tallest brick lighthouse in North America. We climbed it too. Even more steps! But the views from the top were quite lovely. You could even see the path that the lighthouse took when they moved it away from the shore back in the 1990s. 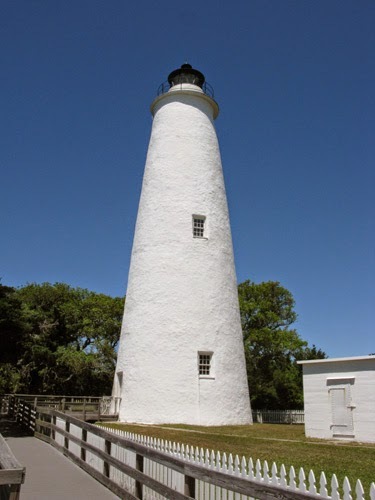 We completed our 'lighouse tour' with a visit to Ocracoke Lighthouse on Ocracoke Island. 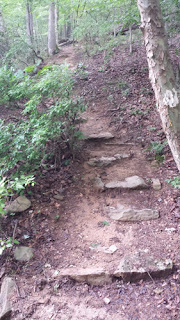 This one is significantly shorter than the other two we climbed, and it's not open to the public, so no more stairs for us! Ocracoke was an interesting island to visit. 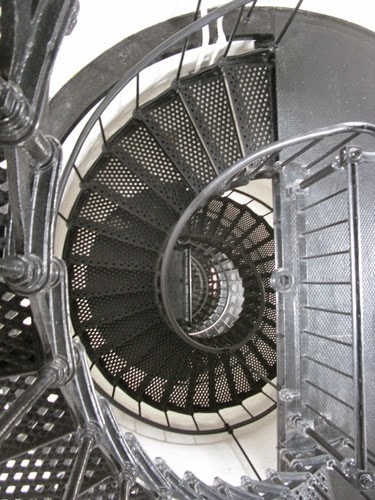 We saw the lighthouse, the downtown harbor, toured the local historical society's tiny museum, and saw the graveyard where four British sailors were buried in the 1940s. We even found a tiny little museum about Blackbeard the pirate, who was killed just off the shore from this island. A few months ago, I discovered this website called Roadside America that lists weird roadside attractions from all over the United States. 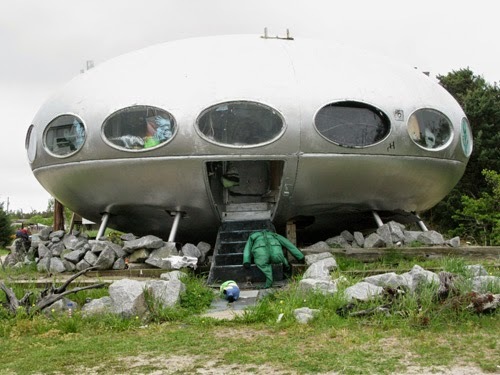 There were quite a few on the Outer Banks, and I think we saw every one of them listed for the southern islands, including this weird ufo house, complete with odd yard art. What makes someone decide to build something like this, lol? We also spent an afternoon exploring the dunes around this abandoned life saving station on Pea Island. It's boarded up, and they've removed the stairs to the porch, so you can't go inside. It was interesting to walk around it though. And from there you can walk up to the mouth of the Oregon Inlet. We stood on a beach that was entirely empty, but you could see that a massive number of birds had occupied the beach in recent days. The sand was covered in bird footprints, and, um, bird poo. Must have been a sight to see when the sands were covered by the birds themselves. Well, I guess that's enough sharing for today. 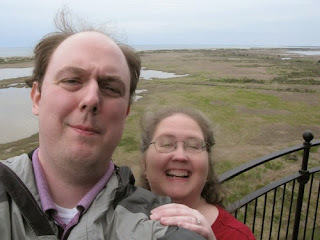 We left the Outer Banks the day after an impressive spring storm. 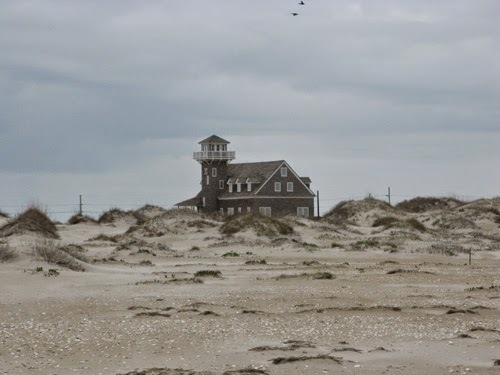 The surf had come up amazingly high that night, and the road off the island was covered with patches of sand. Nature's power is awe inspiring at times like that! Til next time (which will hopefully be sooner rather than later), enjoy your days and stay safe! Good evening (or morning, as the case may be)! I wanted to share another pattern of mine that will be available beginning next weekend. 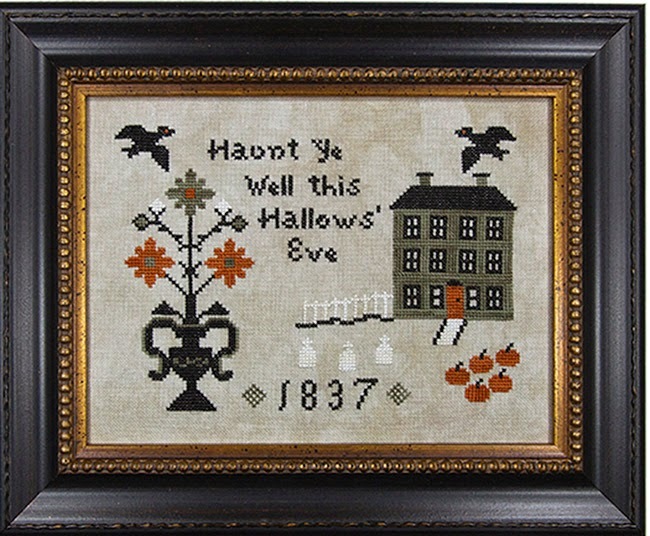 This one is a Halloween piece, similar in style to my Springtime on Hodge Hill design. It is stitched on 32 count Wren linen from Picture This Plus, using Weeks overdyed cotton threads. 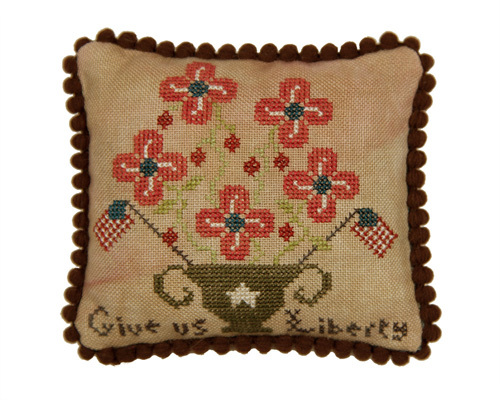 It was fun to design, and fun to stitch. Hope you enjoy seeing it! Just a short post tonight. I will finish up showing my new designs tomorrow or Monday. 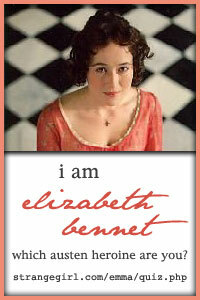 For now, I'm off to finish working on a wedding sampler for a friend. A relative had begun it for her years ago, and I was happy to be able to finally finish it for her. Her relative crosses her x's the opposite direction from me, and she redesigned parts of the chart she was using, so it has been a fun challenge to work on. I'm hoping to be done with it by tomorrow evening. Stay dry, stay cool, find some time to be creative if you can. It's time for St. Charles!!! Despite my best blogging intentions, it seems that another couple of months have slipped away without a single post from me. I think about blogging. I even take photos to use for a post. But then the post never happens, and I'm not even sure why. At any rate, I'm here today, and I wanted to share SOME of what I've been working on these past few months. It's almost time for the St Charles needlework market, and I have 4 new pieces that will be available at the show. I'll share two today, and the other two in a day or two. The model is stitched on 40 count Parchment linen from Weeks Dye Works using silk threads from NPI and Rainbow Gallery. It is almost a perfect square, but not quite. If you stitch it on 40 count, it is almost exactly the same size as the original sampler. 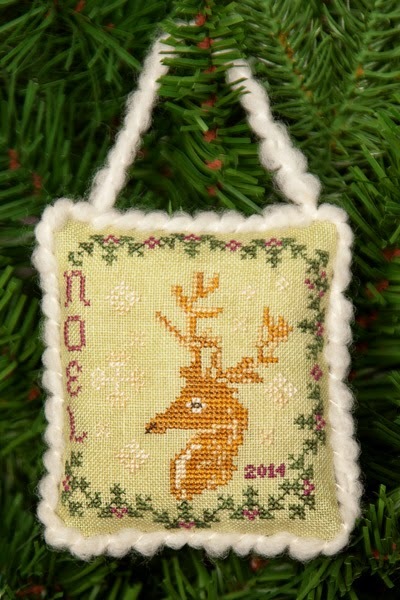 Although it is A LOT of stitching, the only types of stitches used are cross stitch and satin stitch. 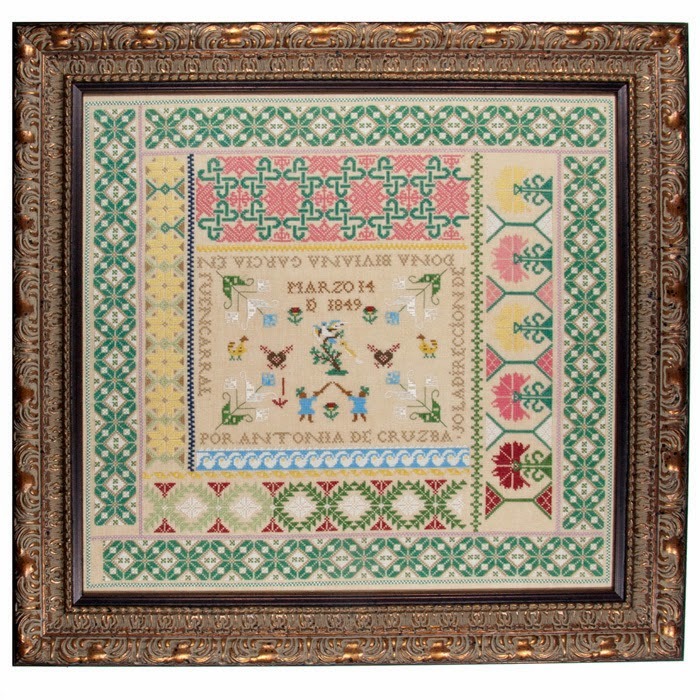 It can be VERY difficult to capture the true color of a stitched piece when you are photographing it, and that is certainly the case with this piece. The ornament is on a lovely piece of 35 count Guacomole linen from Weeks Dye Works, and you don't quite see that pretty green in this picture. The stitching is all done with Weeks Dye Works overdyed cottons. If you like what you see, please ask your LNS to order the patterns for you! 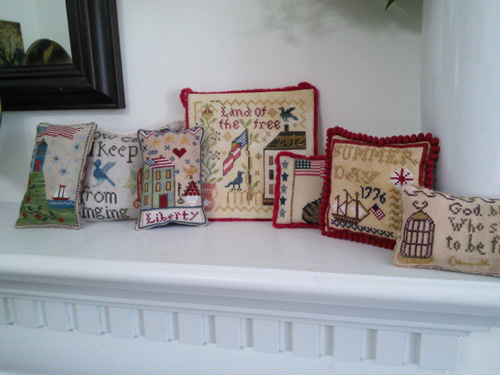 All of my designs are under the name "Threads of Memory," but they can be found in the Cherished Stitches room at the market, or, if your shop isn't going to market, they can be ordered through Cherished Stitches: lucystitch@earthlink.net . 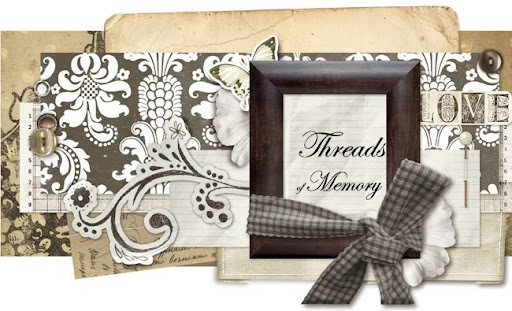 If you have any questions about my designs, feel free to leave me a comment, or email me at robin@threadsofmemory.com . Next time, I will share my Halloween design and a limited edition kit for a small pin pillow. Til then, stay crafty my friends!